As expertly headlined by Mel Gibson...Edge of Darkness makes a virtue of its fatalism, while ace mainstream director Martin Campbell compensates well for the script's shortcomings in the credibility department. 116 min. Warner Bros. Pictures Distribution. Director: Martin Campbell. Cast: Mel Gibson, Ray Winstone, Danny Huston, Bojana Novakovic, Shawn Roberts. In the opening moments of Edge of Darkness, two corpses bubble up from beheath the surface of the Connecticut River, setting the stage for a conspiracy thriller that will endlessly renew its commitment to being a grim piece of work. 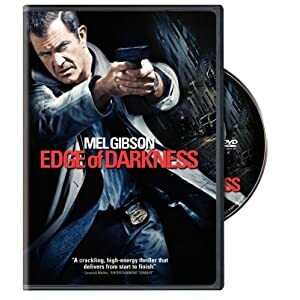 As expertly headlined by Mel Gibson (in his first starring role in eight years), Edge of Darkness makes a virtue of its fatalism, while ace mainstream director Martin Campbell compensates well for the script's shortcomings in the credibility department. Gibson plays Boston Police Detective Thomas Craven, whose visit with his daughter ends abruptly when she dies in his arms. Happy Mel immediately turns into tormented Mel, putting modern screen's great sufferer back where he belongs (best in show: patient moments before a mirror, where Mel has good times like washing off his daughter's blood). Naturally, Craven begins an intense investigation that quickly leads him to his daughter's workplace, a classified nuclear R&D facility named Northmoor that functions at the pleasure of the U.S. military. The company's silky overlord, Jack Bennett (Danny Huston), can't and won't say much about the imposing facility, but Craven only needs a whiff to determine there's something rotten in Northmoor. Edge of Darkness derives from a 1985 BBC miniseries also directed by Martin Campbell, though that story's specificity of time and place necessitated considerable rethinking by scribes William Monahan and Andrew Bovell. The convolutions of the plot require considerable suspension of disbelief, but if one takes the story as a fable-styled power play, there's a kind of pleasure in sorting out the chess moves of everyday avenger Craven, amoral military contractor Bennett, a complicit senator (Damian Young), and a shadowy company man named Jedburgh (Ray Winstone) who amuses himself by playing both sides of the fence. It's the Winstone character and, in particular, his masculine, mutual-respect dialogues with Craven that lend Edge of Darkness a pleasure that goes beyond the simplistic strokes of the film's two compatible genres: conspiracy thriller and revenger's drama. Craven and Jedburgh are two men with little left to lose, and with age, they face questions of mortality and legacy, such as they are. They bond over their tragic lack of offspring and their distaste of corruption and its soulless promise of collateral damage. Jedburgh gets downright philosophical about Craven's investigation and his own role in the case. "We all know what the facts are," he muses. "We live a while, and then we die sooner than we planned." Though the mystery mostly proceeds by wearing down shoe leather, Campbell stages a few kinetic action sequences that come on like bursts of shock treatment between Craven's hangdog conversations with unwilling witnesses. Ultimately, the picture in no way innovates, but it does deliver a certain base satisfaction in seeing justice doggedly, righteously pursued. 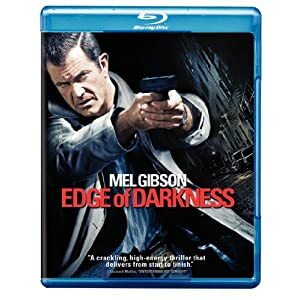 In doing so, Gibson wears his age well, and gives Edge of Darkness a surprisingly strong emotional undertow. Warner's Combo Pack Blu-ray/DVD/Digital Copy release hosts a strong hi-def transfer that accurately represents the film in its color, contrast, and dark shadows (light grain adds to the film-like effect). Detail and texture are strong, leaving a much greater impression than the occasional shadow crush or glimpse of source noise. I can find no fault with the crisp DTS-HD Master Audio 5.1 mix, which sharply delivers dialogue and well-placed sound effects, while lending a rich fullness to Howard Shore's score. Nine Focus Points (30:52 with "Play All" option, HD) include comments from director Martin Campbell, Mel Gibson, producer Graham King, writer William Monahan, editor Stuart Baird, director of photography Phil Meheux, composer Howard Shore, Ray Winstone, Danny Huston, Shawn Roberts, and Bojana Novakovic. The titles give an indication of the topics covered: "Craven's War of Attrition," "Mel's Back," "Director Martin Campbell," "Making a Ghost Character Real," "Boston as a Character," "Adapting the Edge of Darkness Miniseries," "Revisiting the Edge of Darkness Miniseries," "Edge of Your Seat," and "Scoring the Film." Four "Deleted & Alternate Scenes" (5:23, HD) give some insight into the editing process. The disc is also BD-Live enabled. All site content © 2000-2019 Peter Canavese. Page generated at 04/26/2019 03:57:27AM.